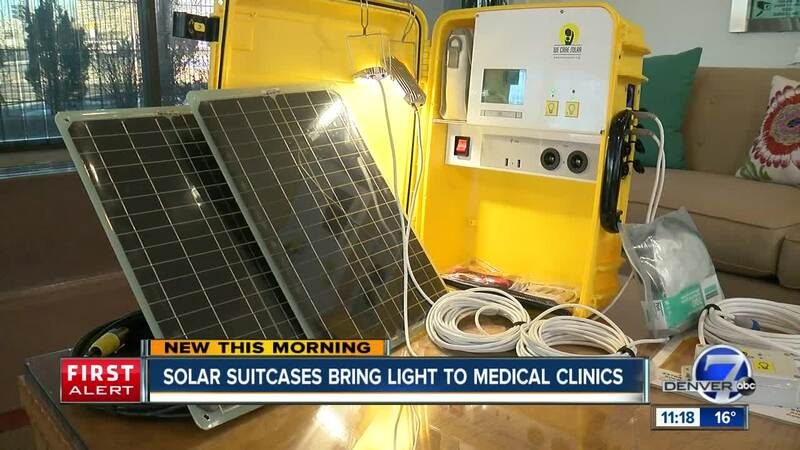 More than 3,500 Solar Suitcases are being used in maternal care centers around the world, thanks to a partnership between We Care Solar and Centennial-based Arrow Electronics. The founder of We Care Solar was working in Nigeria when she saw the high rate of maternal mortality. "Everyone assumed it was a medical problem, but often it was because there was no light," explained Brent Moellenberg, the director of engineering for We Care Solar. "There was no way to power communications equipment, no way to power basic medical care that we all take for granted." "The Solar Suitcase is a complete, off-the-grid, solar electric system that's able to run lighting, cell phone charging, power basic electronics, power fetal Doppler, power a small ultrasound machine, even a laptop in some situations," Moellenberg said. Arrow Electronics partnered with We Care Solar to improve the product using Arrow's expertise in manufacturing, lighting and supply chain. Together they made the product cheaper, which meant making more suitcases to help clinics. The suitcases are in 27 counties around the world. The goal is to put suitcases in 1,000 more clinics in 2019. "I can't tell you how many midwives we've talked to who have delivered babies with a cell phone in their teeth, or using candles or kerosene, or even in the dark," Moellenberg said. "When they see this system and it's for them, it's incredible to see the difference it makes in their lives." Learn more on the We Care Solar website .